Share the post "Meet the Academic Deans"
Academic Deans Joe Ventola, Sharice Richardson, Liaan Pechera, Penny Carlson, and Carol Andrew. 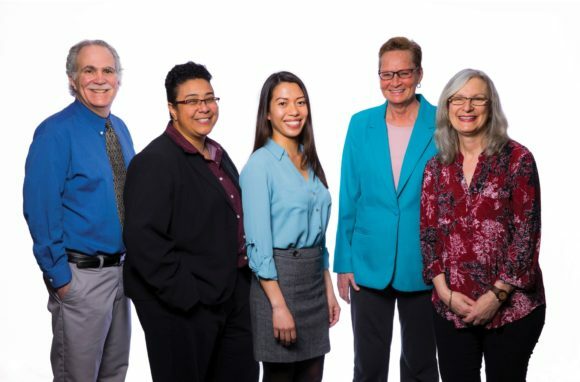 The academic deans pictured here help students navigate SEBS every step of the way, from choosing a major and minor to exploring research, internship, study abroad, and other academic experiences. With all the help they provide, we asked them: What aspect of your job do you think makes the most impact on students? With advising and student scholarship administration, I provide a supportive and trusting place where students can successfully work through their academic and transitional university challenges. I was a first-generation college student at Rutgers University. I have dedicated my career to advising students and helping them take advantage of the opportunities Rutgers offers. Ensuring that Rutgers provides equal access to opportunity for every student regardless of their racial, economic, or family educational background is a central part of our land-grant mission. I try to empower students by encouraging them to take responsibility for their academic plans. We discuss their growth, and I help them visualize how to accomplish their goals. I inspire my students to be proactive about learning, not just in the classroom. By imparting information about the community and their own capabilities, students are able to find and earn their success. When at-risk students walk into my office, many are overwhelmed and having a difficult time. We talk about career goals and possible paths to those goals, and I help put them in touch with university resources. It’s great when students thank me for making a very stressful time just a little less stressful. I believe my biggest impact is made with prospective students, who ultimately apply and enroll. Building bridges by sharing information and hosting informative, welcoming events assists with a smooth transition to SEBS and relieves student stress in the process of the transfer. This results in a productive and positive student experience.